Nora Fatehi looks stunning in desi look! Nora Fatehi in Indian wear! 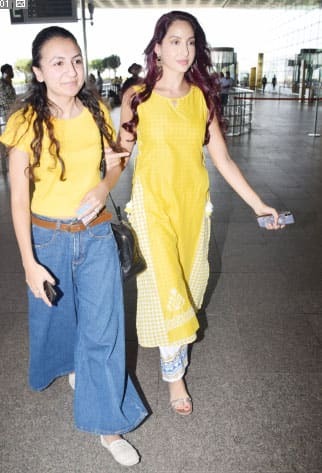 She wore a bright yellow sleeveless kurta with an off white salwar with motifs on it. Her amazing desi look turned heads at the airport and she happily posed for the shutterbugs. Nora will be seen in Varun Dhawan-Shraddha Kapoor starrer 'Street Dancer 3D'.